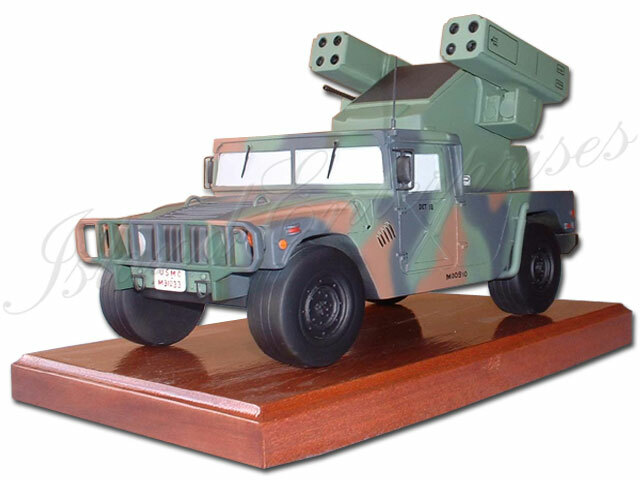 Home → Aircraft, Car & Motorcycle Models → Cars and Motorcycle Models → USMC Humvee "Avenger"
This is all wood, hand carved and hand painted replica of a US Marine Corp Avenger Humvee. We did a group order for a Squadron on Okinawa a few years back. We can make any version of the Humvee you require, in any size and scale. Additionally, we can make a customized base with your choice of carved and painted logos and text. AND REMEMBER!!! We offer a 100% money back guarantee if you are not convinced you have bought the most accurate, highly detailed product available on the market!!! DISCOUNTED PRICES AVAILABLE FOR MULTIPLE AND GROUP ORDERS...PLUS YOUR SHIPPING COST ARE DRASTICALLY REDUCED.